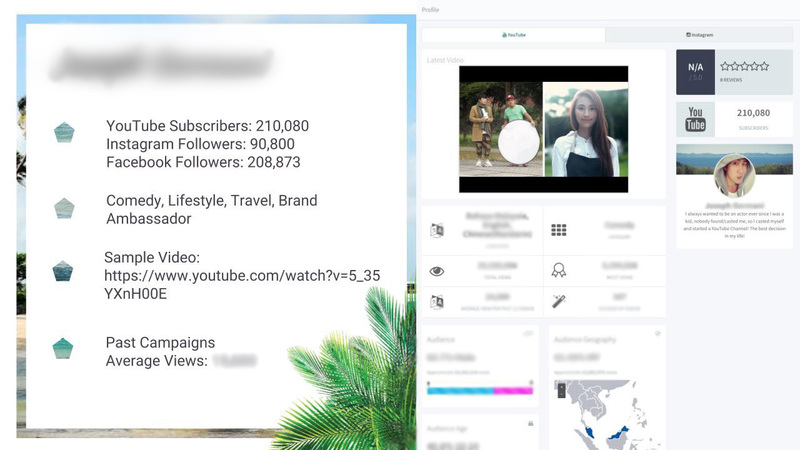 Yes, even the tourism industry uses Influencer Marketing nowadays. Curious on how we pitch our proposal to this industry? We were really excited to receive this brief. I mean, who wouldn't? It's Tourism Indonesia! We literally spent an entire day just drooling while researching about all the places we could take our influencers to! We had high hopes for this one. This was a complete proposal, we wanted a theme for this campaign, and to drive towards an objective. Our theme was Wanderlust! which we felt would also fit our millennial influencers. They'd absolutely love it! Themes are important as it illustrates whatever universal idea the story puts forward. It is the central idea behind your brand story. 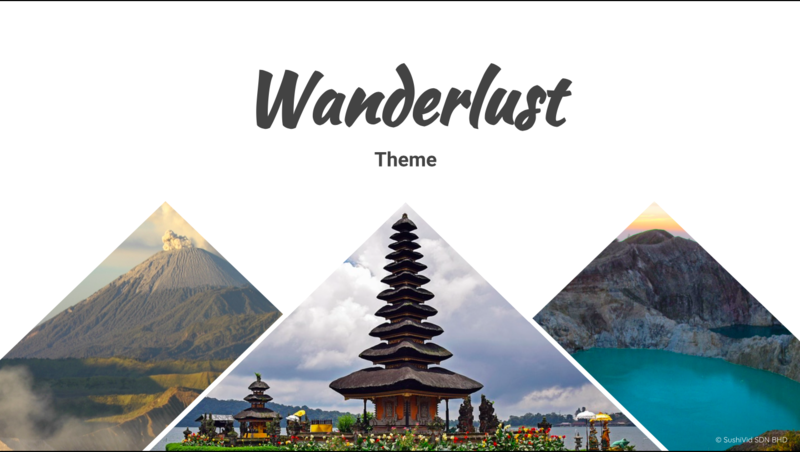 To us, we chose 'wanderlust' to show that Indonesia is the country to fulfil/start your desire for travelling. 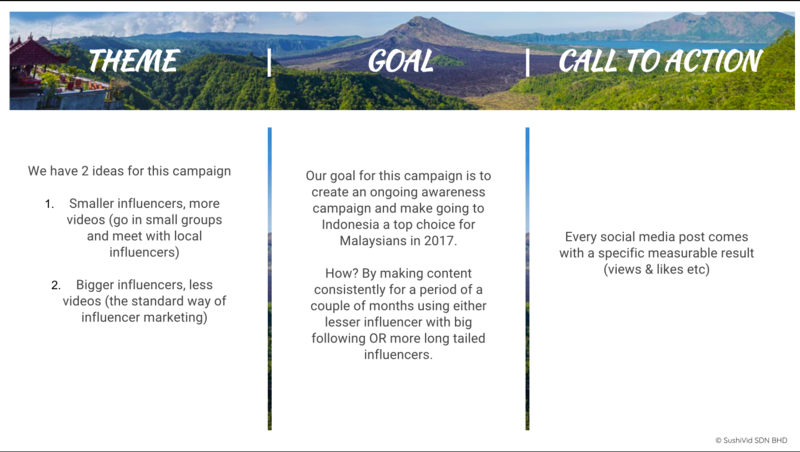 In this slide we provided our ideas as well as the goals we plan on achieving with this campaign and of course 'how' we plan on achieving it. The goal was to make Indonesia the destination of choice! It's a huge goal but we looked into our list of influencers, and felt it was totally doable. 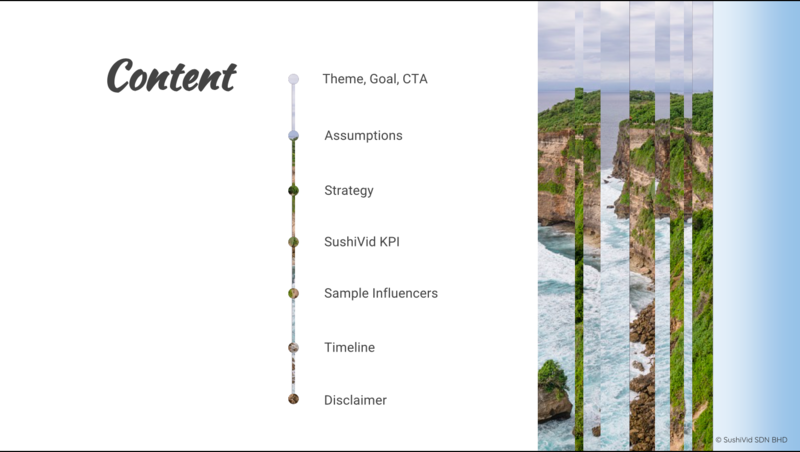 We believe our influencers would really be able to drive their audience to Indonesia through their stories, their photos and vlogs. 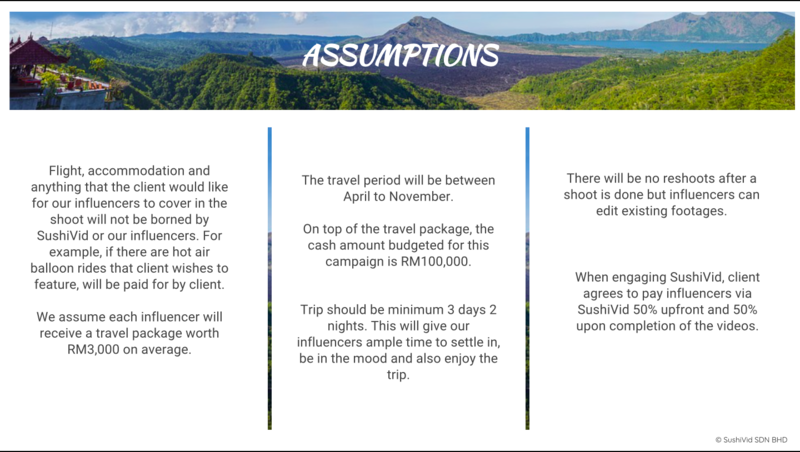 Since the Influencers are needed to be in a specific country, we, as the agency have to make a few assumptions/ideas to ensure that both us and the clients are on the right page- especially costs wise. We were thorough in our planning, we included allowances, travel expenses and the whole lot. 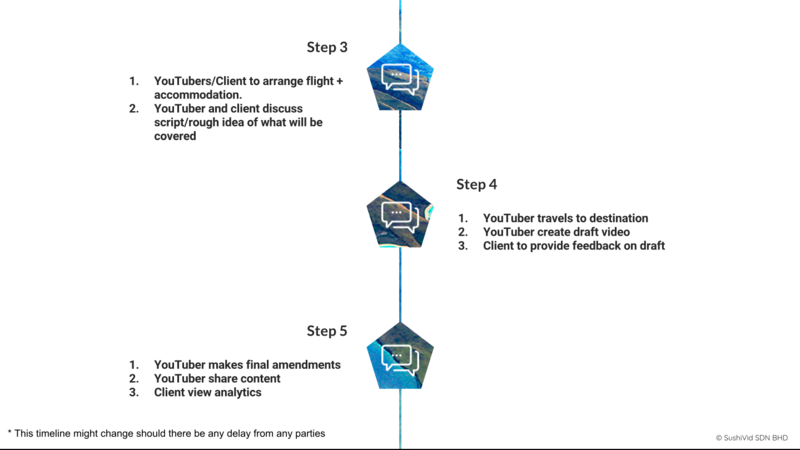 This way, our client would know what to expect when engaging our influencers, not just the fees but the whole thing. The budget wasn't set but we made a couple of assumptions, and figuratively made this proposal with a budget of RM100,000. 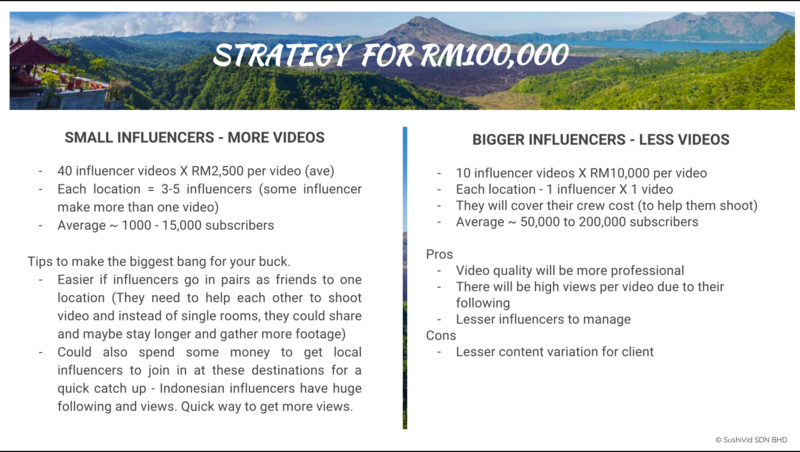 For RM100,000 - we gave them two set of influencers, the smaller ones and the bigger ones. For the smaller ones, we were planning to create 40 influencer videos (Where to find this price, honestly?) 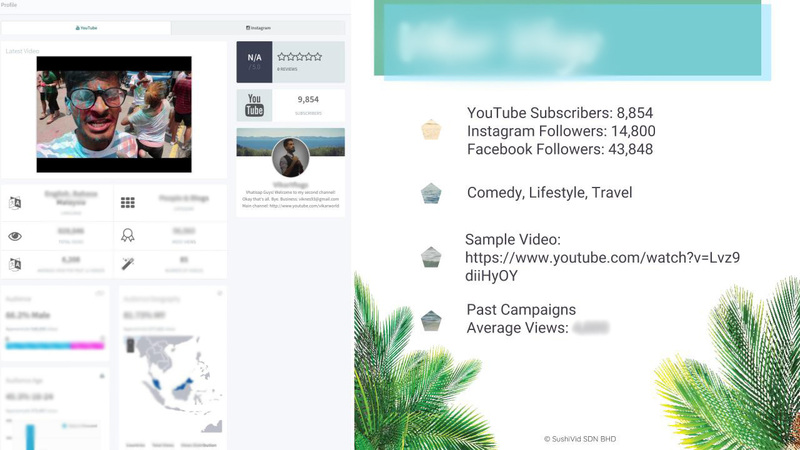 and the bigger ones, just 10 influencer videos. Personally, we preferred the smaller influencer lot because we felt they were hungrier, and is more appreciative of the job that our bigger influencers. Of course, our bigger influencers would have more views and perhaps more experience with their content - hence more engaging content. We shortlisted a few Influencers whom we believe will create an attractive video to showcase the wonderful places to visit in Indonesia. 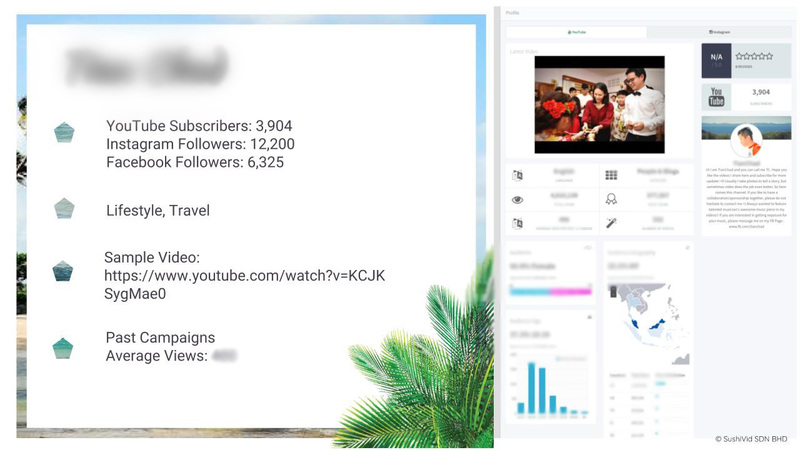 Ultimately, our goal is to make people want to go to Indonesia- what better way than to get influencers to record and share with us their travels and adventures in that beautiful country. 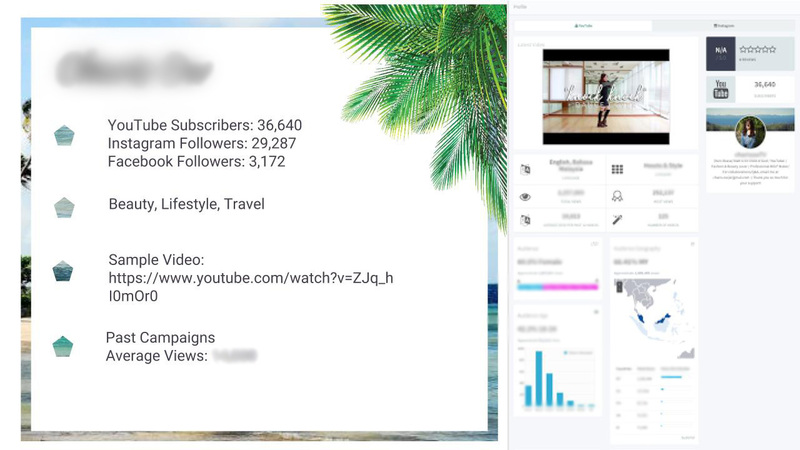 This lovely lady is known for being a beauty, lifestyle and travel Influencer. She's a frequent traveller with a passion for fashion and we always look forward to watching her awesomely edited travel videos on youtube. Aesthetics aren't everything when it comes to YouTube videos. 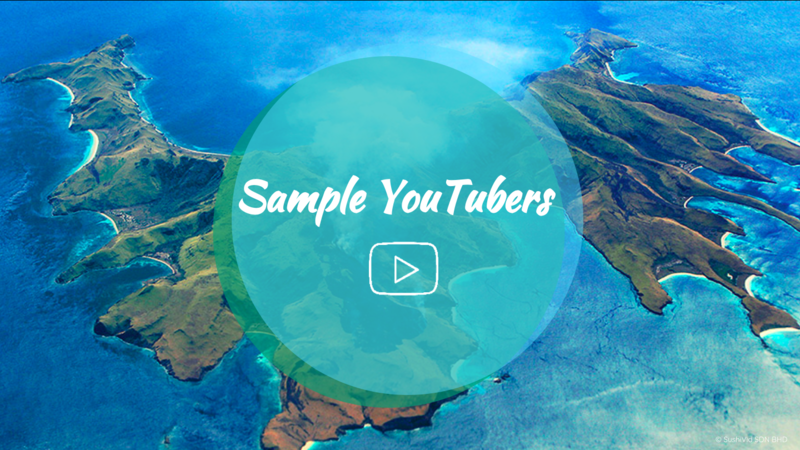 It's about how engaging you are and getting the viewers to sit through your whole video without feeling bored. We chose this Influencer because he's funny and his videos are always fun to watch. Whether it's on his main channel or his vlog channel, his videos will make you laugh. Visual Story Teller- That's the best way to describe this Influencer. He doesn't narrate in his Travel Videos, he let's his surrounding talk for him. He takes us with him on his adventure solely through visual vibes. This Influencer is also a frequent traveller and a visual story teller. 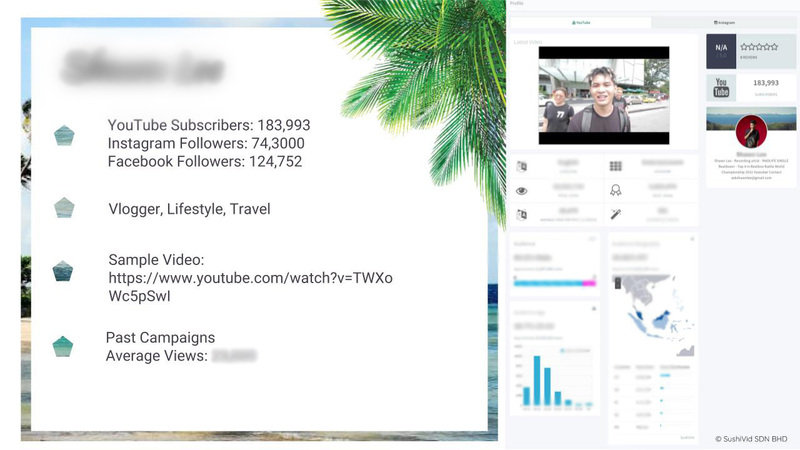 His travel videos are fun to watch and getting to see him travel to different parts of the world allows us to travel vicariously to him. Effort- One word to describe his videos. He puts a lot of effort in making his videos- trying to make it as engaging as possible. He talks us through his adventures during his travels and never fails to ensure the viewers see the beautiful scenery surrounding him. The timeline displays the list of events and how we manage clients expectations by telling them what happens once they engage us. Timelines are useful to record any type of development and help viewers to track past and ongoing events. 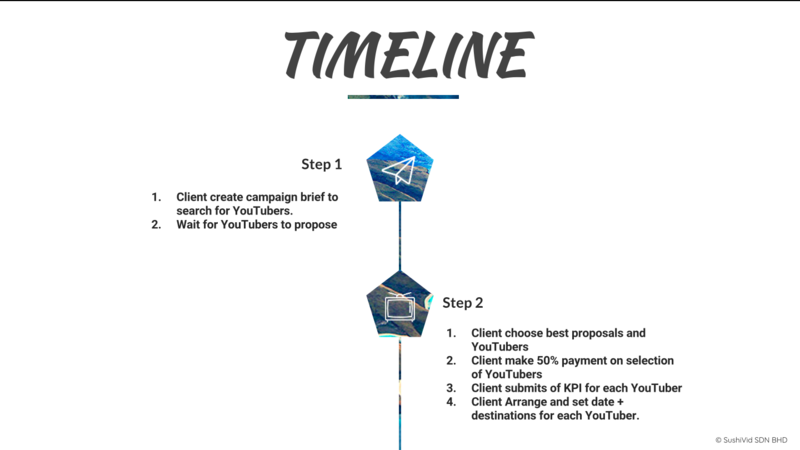 Notice that we do ask for 50% upfront payment from the client. Although some clients would have their preferred payment terms, we also have to accommodate our influencers. The 50% payment upfront, would help us to pay for the flight tickets, book their hotel stays, and mobilize our influencers immediately.